Okay isn’t Jet’s new dinner bowl the coolest thing ever? LOL. I love it! It came yesterday in the mail. I ordered it from Etsy, a store called InAGlaze on Etsy. She did an awesome job. The bowl itself wasn’t even really too expensive. The shipping was a bit much, but of course I wanted to make sure it got to me without breaking! I’d order one for each dog but I can’t afford it right now. Dang. I really love fun, fancy bowls. 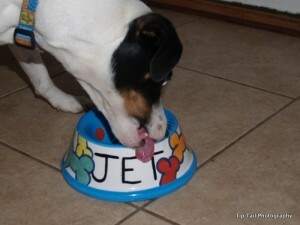 Now I can throw him a birthday party, send out some birthday invitations, and make him a cake in his cute bowl! 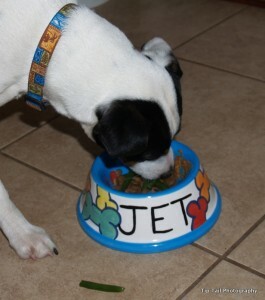 So anyway I’ve been feeding Jet some green beans in his food. He pushes them around to get to the kibble and it slows him down. Or else I put chunks of frozen veggies in there, cauliflower or broccoli mainly. He eats his kibble first, then crunches on the veggies. I hope it helps slow him down a bit. I’ve tried putting my hands in his food, throwing more food in there, and other things. But still he seems to want to wolf his food down now. He is at a good weight, but still he thinks someone is going to steal his food. No one does, so I’m not really sure where he got the idea from! The bowl is very cute! I feed the corgi and lab from slow feeder bowls, I like the Skid Stop Bowl the best. The toller actually chews his food instead of inhaling when he does decide to eat so he doesn’t need it. I’ve tried a rock in the bowl, a muffin tin, and just throwing it on the floor for the corgi but this bowl helps a lot more. It’s no surprise Etsy would carry something like that; they have all sorts of awesome stuff.